When you choose to spend your holidays, you want to find fun things to do in Napa. You may be surprised once you begin researching the variety of the fun activities available in the region. Consider this list of fun things to do in the Napa Valley, and you’ll find they’re worth the discovery. If you’re mostly interested in wines and things related to them including venues and events, there’s no better place for you to intensify your passions than in the Napa Valley. Take time to wander through the vineyards (this is better when guided by a professional wine expert). Visit several different wineries, from the old, traditional wineries and newer ones that boast modern facilities. Consider visiting one remarkable winery, Castelo di Amorosa, which was built in recent years but in the old 13th-century Mediterranean architecture. Have fun exploring the castle winery’s grand halls, massive caves, defensive towers, and innermost wine cellars while sampling their fine wines. You may also want to attend food and wine festivals where you have the chance to try your hand at food and wine pairing. Napa gives you the chance to try and sip more wines — from the rare vintages down to the modern favorites. The possibilities and adventures are endless, as Napa unfolds newer and more exciting offerings for every wine connoisseur. If you prefer the art and culture more wine tasting, the Napa Valley is never deprived of those. Rich in history, arts and culture, the region boasts several museums and studios that feature both old and modern pieces. If you love both wine and art together, then one museum named The Hess Collection Winery and Art Museum will surely satisfy your cravings for both passions. The museum has a beautiful garden, too. Tourists absolutely love nature and parks. The Napa Valley has many of the world’s loveliest natural sights. Explore several parks such as Artesa Vineyards and Winery, Skyline Wilderness Park, the dog-friendly Alston Park, Westwood Hills Park, and so many others. You can do your morning hikes in any of these places, too. If you ask tourists you’ve known about the highlights of their Napa vacation, they would most likely say the sunrise hot air balloon flights are what they remember most! Why is that so, you wonder? People would say that the beauty of the Napa Valley is best seen when you’re up in the sky, and it’s quite worth the try. You may love to enter this kind of airborne adventure — it will surely be a one-of-a-kind experience — but you are concerned about the safety of riding a hot air balloon. When you choose Balloons Above the Valley (BATV), you will not feel that fear anymore. Instead, you get to be ecstatic flying in the morning sky! Our hot air balloon pilots are licensed, have extensive experience in maneuvering flights, and are committed to conduct the safest flights for themselves and the tourists. You will be in good hands once you choose us! Once you’re riding on a hot air balloon, you will see a different kind of beauty of the Napa Valley — like you’ve never seen before. Tidy rows of grapes, trees and shrubs that boast several shades of green in the summer; warm hues of orange, yellow and red from the trees and grapes that are ready to be harvested; and brilliant yellow fields of the wild mustard flowers and emerald greens of the hills and valleys in the winter and spring. You may never want to miss a moment by taking scenic and panoramic shots of the beautiful Napa landscape. Balloons Above the Valley is more than just hot air balloon rides. We offer hot and delicious pre-flight breakfasts, sumptuous post-flight brunches, wine tours, and luxury transportation, and lots, lots more! We also do corporate and group meetings, weddings and wedding proposals, and exclusive flights with private post-flight brunches. With over thirty years experience, we have been providing nothing but the safest, most enjoyable, and most unforgettable sunrise hot air balloon flights and wine tours. 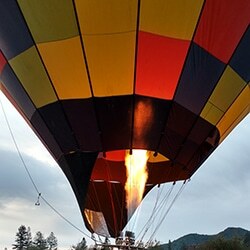 Include sunrise hot air balloon flights in your list of fun things to do in Napa. 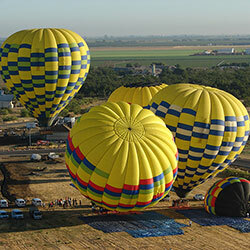 When you decide to choose, we hope you choose Balloons Above the Valley for the ultimate flight experience.